Introduction: There are few data on heart failure (HF) burden and none available on the community prevalence of HF in India. We conducted a study aimed at determining the HF prevalence in a rural community as well as tertiary hospital care setting in North India. We also reviewed the existing literature regarding the estimated and projected prevalence of HF in India. 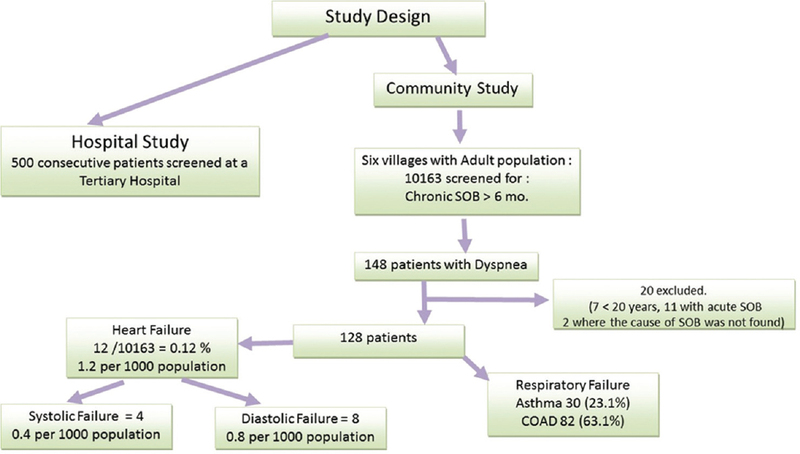 Methodology: All adults (>20 years) with chronic breathlessness in six villages under a primary health care center in Northern India were identified and evaluated with standardized questionnaire and physical examination by trained health care workers. HF was diagnosed by standardized criteria and a transthoracic echocardiogram was performed in all subjects. In the hospital study, 500 consecutive patients presenting to our tertiary referral hospital were evaluated for the diagnosis of HF. For the systematic review, all published studies addressing HF or the burden of risk factors in India were identified. Projections for the absolute HF burden were made using local data and global studies of HF incidence, morbidity, and mortality. Results: Among the surveyed rural adult population of 10,163 patients, chronic breathlessness was present in 128 (1.3%). HF was present in 9% (n = 12), of which 67% (n = 8) had preserved left ventricular (LV) systolic function and 33% (n = 4) had LV systolic dysfunction. Therefore, the prevalence of HF in this general community was 1.2/1000. All patients with HF and preserved ejection fraction had poorly controlled hypertension. In the hospital study, of 500 consecutive patients, 20.4% had HF. Rheumatic heart disease (52%) was the most common cause followed by ischemic heart disease (17%). The mean age of presentation was 39 ± 16 years. The prevalence of HF in the outpatient department patients was 22.5% below 30 years and 14.9% above 50 years, reflecting the young population of HF. For the estimates concerning HF burden in India, projections were made using both age-specific extrapolations from developing countries and data regarding development of HF in the presence of risk factors. The estimated prevalence of HF is about 1% of the total population or about 8–10 million individuals. The estimated mortality attributable to HF is about 0.1–0.16 million individuals per year. Conclusions: While our hospital data are consistent with the HF burden and etiology expected in a government tertiary hospital setting, our community-based study is the first of its kind reported from India. The community study demonstrates a surprisingly low prevalence of symptomatic HF in the surveyed villages. This could be partially explained by the rural farming-based community setting but is also likely due to under-reporting of symptoms. Our review of the projected national estimates suggests an alarming burden of HF in India despite a younger population than the developed nations. A significant proportion of this burden may be preventable with better screening and early and adequate treatment of the risk factors. We report the results of a study for an estimation of HF in a rural Northern Indian community as well as data on the etiology of HF among patients attending the outpatient department (OPD) of a tertiary hospital in North India. We also present studies related to the burden of HF and its determinants in India/persons of Indian origin. Based on this evidence and with the help of data available from other developing and developed countries, we have also attempted to project the expected burden of HF in India. Two-dimensional and M-mode echocardiography done at a central facility in a standardized manner on the same machine. Based on the etiology of dyspnea, subjects were classified into respiratory patients or cardiac patients. Respiratory patients were subclassified into asthma and chronic obstructive airway disease (COAD). Cardiac patients were subclassified into systolic or diastolic dysfunction based on the echocardiography results. For the hospital component of the study, data were collected on HF from patients coming to the OPD services of AIIMS and patients being admitted to the emergency services of AIIMS with acute decompensated HF (ADHF). Data collection from the OPD was done after the initial investigation had been completed and treatment initiated and included the final diagnosis and detailed echocardiogram. Data from the admitted patients included all details of treatment during the hospital stay and follow-up for 3 months. The study period was between 2008 and 2012 for the community as well as the hospital study. This study, the INDUS study (INDia Ukieri Study) was part of the collaborative work being done as part of the UK India Education Research Initiative. In a case of RHD, it was considered the main etiology irrespective of the presence of comorbidity as long as lesion severity would explain the symptoms. In the presence of any documented history of myocardial infarction (MI), unstable angina or stable angina supported by evidence of left ventricular (LV) dysfunction (ejection fraction [EF] <50%), IHD was considered the primary etiology. Hypertension was considered as causative if it was sustained, uncontrolled, or had evidence of other complications such as stroke. Dilated cardiomyopathy was considered the main etiology if symptoms coexisted with LV dysfunction, in the absence of IHD, hypertension, and other possible causes. Congenital heart disease was considered the primary etiology if symptoms were associated with a large left to right shunt or an obstructive lesion causing LV dysfunction. Asthma was diagnosed based on the presence of morning exacerbation of symptoms, wheezing, chest tightness, past asthma attacks, use of bronchodilators, decreased peak flow rate, reversibility to bronchodilators, exposure to dust, exposure to cooking fuel combustion biogas, smoking, and family history of asthma. COAD was diagnosed based on the presence of cough and expectoration on the most days for at least 3 months in a year for 2 consecutive years. Systolic dysfunction (congestive HF [CHF]) was diagnosed on the basis of the presence of symptoms of CHF with systolic dysfunction (EF <50%). Diastolic dysfunction was diagnosed on the basis of symptoms of HF with normal EF with an explanation for diastolic dysfunction such as uncontrolled hypertension. Projections from the expected rate of HF development from major risk factors (e.g., coronary artery disease [CAD], hypertension, RHD, etc.). An adult population (>20 years of age) of 10,163 was identified in the six selected villages of the Primary Health Centre in Dayalpur (Block Ballabgarh, District Faridabad, Haryana, India). This population was screened twice weekly by visiting physicians over a period of 3 months. Of 148 patients identified with dyspnea, 20 were excluded owing to being underage/acute dyspnea/cause of dyspnea not known. Of the remaining 128, 12 were found to have HF corresponding to a prevalence of 1.2/1000 of the sampled population. Four patients had systolic HF while 8 were found to have diastolic HF. Thirty percent of patients with HF had paroxysmal nocturnal dyspnea while 40% had orthopnea and only 10% had pedal edema. Fifty-nine percent patients with respiratory cause of dyspnea had a history of smoking while only 5% of patients with HF were current smokers [Figure 1]. Other characteristics of the sampled population are provided in [Table 1]. The mean age was 58.3 ± 10.4 years. Male:female ratio was 1.9/1. Eight patients had uncontrolled hypertension, three had CAD, and one had dilated cardiomyopathy. Figure 1: Study design and flow. Five-hundred consecutive patients were also screened in the cardiology outpatient and inpatient in our hospital for HF. Of these, 102 (20.4%) were found to have HF. 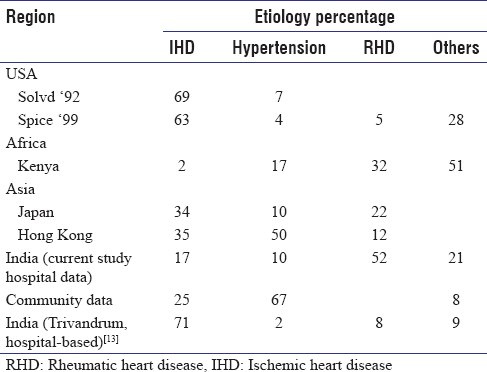 The most common etiology of HF in our tertiary hospital setting was RHD [Table 2]. The mean age of presentation was 39 ± 16 years, reflecting the predominance of RHD. The prevalence of HF at age <30 years and 30–50 years was 22.53% and 24.29%, respectively, while it was 14.91% in patients presenting above 50 years of age. In the first of its kind study in India, the prevalence of HF in a rural community was rather low at 1.2 cases/1000 of population. While it is recognized that the burden of CVDs in rural areas is lower than urban areas, our findings may not necessarily be representative of national data as a higher prevalence of CVD is reported in rural areas from South India. Possible reasons for this unexpected result are discussed later in this section. The prevalence of HF among those presenting to the hospital for a cardiology consultation was expectedly high and the most common cause was RHD. This may be due to a bias of overrepresentation of RHD typically seen in tertiary level government hospital settings and has been reported in other hospital-based studies from India as well. The epidemiology of HF in the Western world is well defined where the crude incidence and prevalence of HF vary from 1–5/1000/year to 3–20/1000 persons, respectively., As expected, the incidence and prevalence vary according to the setting of sampling, age of the population, and the criteria used to define HF. The lifetime risk of developing HF in adults aged 40 years in the US general population is 14–20%. In a rural population-based project in Southern India, in 45 villages, the verbal autopsy instrument was used to ascertain the cause of death among adults ≥30 years of age. Of 1170 deaths in adults, HF was responsible for 2.4% of all-cause mortality. Besides HF, other cardiovascular causes including CHD, cerebrovascular disease, and other heart diseases (hypertensive heart disease, RHD, and other unspecified cardiovascular conditions) accounted for 3.9% of all-cause mortality. Besides, 4.7% of adult deaths were sudden deaths. A substantial proportion of mortality in these cardiovascular and sudden death cases is likely to be due to HF as well. Thus, it is reasonable to assume that HF contributed to 3–4% of all-cause mortality in adults. This could be even higher considering the fact that half of all ill-defined deaths (18% of total) occurred in elderly and were mostly likely to be cardiovascular in origin. These data are in rural India, which has a majority of Indian population but has a lower burden of CVD. The burden is likely to be higher in urban areas which have higher prevalence of CVD. A study from a tertiary hospital in Pakistan investigated the prognosis of hospitalized new-onset HF due to LV systolic dysfunction (LVSD) (EF <40%). Of the 196 patients fulfilling these criteria, 77% had IHD and the mean EF was 25%. During a median follow-up of more than a year, 27.5% died while more than 50% had a death or repeat hospitalization. This is similar or more than the event rates reported in the Western literature. Another study from Singapore reported the 5-year outcome in 225 patients with LVSD who were discharged alive from the hospital. In this multi-ethnic population, Malay and Indians were more likely to be hospitalized as compared to Chinese. The 5-year mortality rate was 67.5%, which is unusually high. In a recent study from North India in patients with ADHF, in-hospital mortality was 30.8% and the majority of in-hospital deaths was due to progressive HF. Cumulative 1- and 3-month mortality rates of discharged patients were 15.8% and 26.3, respectively. In an HF registry, mean age of patients was 56 years for women and 58 years for men. Of the 714 participants, 43% were women. CAD as a cause of HF was more frequent in men (67.4% of total vs. 46% of total in women). However, valvular heart disease and dilated cardiomyopathy as a cause of HF were more common in women (18.8% and 22%, respectively) than in men (10.6% and 15%, respectively). Women more often had preserved LV EF (EF > 40%) than men (48% and 31%, respectively). In another study from central India looking at etiology of decompensated HF in a large secondary hospital, RHD was responsible for more than half (n = 125; 52%) of all admissions for HF. Ischemic and/or hypertensive heart disease was found in 27% of all patients. Similarly, our study of 500 consecutive patients presenting to our department found Framingham criteria-based HF in 20% patients. These data however are likely to have a bias, in which RHD is often overrepresented among referral government hospitals. In another study of admitted patients of HF (as per Framingham criteria) from South India, 94 consecutive patients aged >60 years were studied between 2003 and 2005. Mean age was 69 years and 46% were females. The most common etiology was CAD (55%) followed by valvular heart disease (13%), idiopathic dilated cardiomyopathy (10%), and hypertensive heart disease (6%). HF of unknown etiology was present in 12% of all patients. Almost a quarter of patients (22%) had had a previous MI. HF with normal EF (EF >50%) was present in almost a quarter (23%) of the patients. This is lower than that reported in the Western literature where, however, the mean age of HF patients has generally been more than that described in Indian studies. In a study from Trivandrum, patients were younger, had a higher prevalence of IHD, and had a higher mortality compared with published data. Chronic RHD is a major source of cardiovascular morbidity and mortality in Southeast Asia. There is significant geographic and socioeconomic heterogeneity in the burden of RHD even within the Indian subcontinent with low rates reported from Southern India. The type of RHD also varies according to age and the population sampled, but the overall mitral valve disease is far more prevalent than aortic valve disease which usually occurs in association with mitral valve disease. While predominant mitral stenosis and aortic stenosis cause symptoms of HF early in their course, the regurgitant lesions cause HF with late and advanced disease. An exception to this is rheumatic fever (RF), which is an important cause of HF in children even now, in India. Thus, the prevalence of HF in RHD will depend on the setting of the study, i.e., hospital or community, children or adults, etc., According to the Global Burden of Disease Study Estimates of 2001, there were 198,000 deaths annually due to RHD in the South Asia region, representing about 1% of all deaths. A major component of this mortality is likely to be due to HF. A WHO international community-based project in seven developing country centers (including Delhi, India) during 1969–1979 of combined RF and chronic RHD enrolled 2969 patients. Approximately 19% had definite or suspected CHF. Twenty-three percent of those with mitral stenosis, 10% with mitral regurgitation, 17% with mixed mitral valve disease, and 18% with both mitral and aortic valve disease had symptoms of definite HF. Of those with definite HF, 50% were in the New York Heart Association (NYHA) Class II and 37% in NYHA Class III. In a recent representative rural-based sample from Pakistan, approximately half of those affected were in NYHA Class II while the prevalence of NYHA Class III or IV HF was about 20%. In a large study reported by Arora et al. in the 1980s from a large tertiary level hospital from Delhi, more than 2500 individuals with chronic RHD were followed up. About 20% had recurrent admission due to CHF. In another reported study of 100 new or operated RHD patients from Chennai, the prevalence of CHF was 24%. In a rural cohort of RF/RHD in Punjab, during 1263 person-years of follow-up, the mortality was 32.5/1000 person-years with mean age at death of only 24 years. A substantial proportion of these deaths is likely to be due to HF. In another community-based study by Grover et al. in rural Punjab with a follow-up of 3 years, among 32 patients with chronic RHD at baseline (from a population of 114,610), 3 died (~10%) due to progressive HF symptoms, largely due to untreated lesions. Thus, overall, it can be assumed that the prevalence of significant HF in RHD is likely to be at least 20–30% of the overall burden with an annual mortality rate of about 3%. Naturally, this would also depend on the number of corrective procedures carried out likely valvuloplasty/valve surgeries, many of which are not carried out due to financial issues. In a study by Jose and Gupta from a large tertiary hospital, the 30-day HF rate with ST elevation MI (STEMI) among 1320 consecutive patients was 5% while in the National MI registry from the USA, HF developed in 8.6%. In the Framingham follow-up study, the 30-day and 5-year rates of HF were 23% and 32 in the decade 1990–1999 after MI%, respectively. While the mean age of participants in the Indian registry was 56 years, the mean age of participants in the Framingham study was 69 years, thus underscoring the contribution of age to the development of HF. In the CREATE-ECLA study, which had a significant enrollment from India (8060 of 20,201 participants), the 30-day rates of development of HF were approximately 17% and the 30-day mortality was 10%. In another cross-sectional study of 120 consecutive patients with STEMI presenting to a large hospital in central India, the 30-day HF rate was 2% below the age of 60 years and 9% above the age of 60 years with 30-day mortality rates of 12.5% and 39%, respectively. The OASIS 2 registry, looking at outcomes of non-ST elevation (NSTE) acute coronary syndrome (ACS) in hospital settings, enrolled 1028 patients from India. The mean age was 57 years and 42% had a previous MI. The prevalence of HF was 7.2% at baseline in comparison to 11.5% in developed nations (who had a mean age of presentation of 64 years). The CREATE registry investigated the outcomes among more than 20,000 patients admitted across India with ACS. History of antecedent HF was present in 1.6% (2.8% in those with NSTE-ACS and 0.8% in those with STEMI). By The Global Burden of Disease 2001 Estimates, the mortality due to hypertensive heart disease in South Asia region is about 90,000/annum and a significant proportion of which is likely to be due to HF (other major reason being sudden cardiac death). Incident development of depressed LV EF in the cardiovascular health study stratified by quartiles of LV mass increased from 4.4% in the lowest quartile to 15% in the highest quartile for measurement by echocardiography and 5–15.2% for electrocardiography (ECG). Even with aggressive lowering of blood pressure (BP) as in LIFE study, the actuarial rates of new onset HF with LV strain pattern on ECG were 8.8%. Pednekar et al. carried out a large field survey in Mumbai during 1991–1997. BP data were available for 87,459 men and 59,368 women. The prevalence of Stage II hypertension was 13.1% in men and 16.7% in women. Overall, mortality due to hypertensive heart disease was approximately 0.2% yearly in men and women among those with Stage II hypertension (214 deaths during 110,768 person-years of follow-up). Of all the cardiovascular deaths among Stage II hypertensive, 14% in men and 25% in women were attributable to hypertensive heart disease. In a Framingham follow-up study on the development of HF, among hypertensive subjects who developed HF, more than three quarters had Stage II hypertension and one-fifth had LV hypertrophy by ECG criteria. The development of HF occurred in those with hypertension at baseline at a yearly rate of 1% (357 cases during 35,768 person-years follow-up). At 5 years, almost three-quarters of those who developed HF had died. In randomized trials for hypertensive therapy, the rate of development of HF has been 8.5/1000 patients/year, equal to the development of stroke, while approximating the development of CAD. The approximate prevalence of HF in hypertension has been in the range of 5–10%. 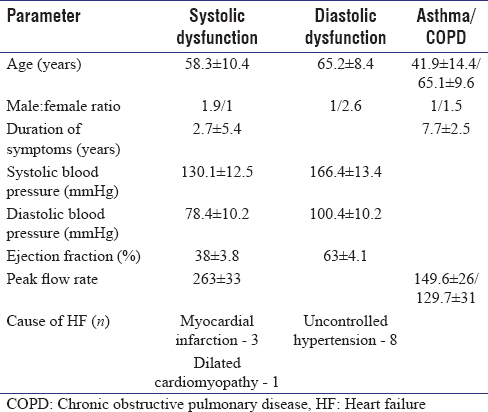 [Table 3] tabulates the etiology of HF as seen in different geographical locations worldwide. It is estimated that the burden of CAD in India is approximately 29.8 million with approximate prevalence being 10% in urban areas and 4–5% in rural areas. The burden of ACS is estimated to be about 3.7 million annually. The prevalence of hypertension by older criteria (which lead to diagnosis of more severe hypertension, BP ≥160/95) is approximately 11–15%. The prevalence using lower thresholds of 140/90 is in the range of 25–40% in urban areas and 10–15% in rural areas. It has been estimated that the overall burden of hypertension in India is about 118.2 million. Diabetes, an important risk factor for development of HF, is widely prevalent in India. The prevalence of diabetes in urban Indians is in the range of 8–15% among adults while that in rural areas is approximately 2–4%. RHD is common in India. As per WHO estimates, the mortality from RF/RHD in Southeast Asia is reported to be 7.6/100,000 population and the prevalence to be 1–5.4/1000 in school children. The total prevalence of RHD in India was approximately 1.4 million in 2001 (or about 0.09% of total population) with projections of about 500,000 new cases added each year. By WHO estimates, approximately 25% of all RHD worldwide had CHF, a large proportion of which eventually require cardiac valve surgery. Even considering a more conservative estimate of 20%, the estimated burden of HF due to RHD will be at least of 0.25–0.3 million nationwide. Congenital heart disease complicates about 0.8% of all live births and HF of significant severity is present in about 20% of these and thus with an assumed birth rate of 27/1000, 54,000 children have HF due to congenital heart disease every year. The overall prevalence is expected to be about 0.3–0.5 million children. Age is one of the most important risk factors for development of HF of any type. In a study from the UK, about 20% of the community surveyed were above 65 years of age. However, 80% of incident HF were in this age group. Similarly, in the USA, the population above 65 years of age is about 12%. In India, the prevalence of old age >65 years is about 5.5% or about 70 million individuals. If we are to assume that the causation of HF due to the complex of age, CHD, hypertension and diabetes is similar worldwide, assumptions from the US population can be transferred to the Indian scenario. Because the age structure of the population in the two countries is different, projections can be made by strata of age. While the approximate overall prevalence of HF in the US is 1.76% (4.8 million individuals), it rises from 2% in the age group 40–59 years to 5% in the age group 60–69 years and 10% in 70+years of age. Projecting these to the Indian population, the approximate prevalence of HF in India would be about 10 million or about 0.9% of the total population. The prevalence of self-reported MI in the US population is about 4% varying from 0.8% in the age group 18–44 years to 4.8% in the age group 45–64 years and 12.9% in the age group ≥65 years. Projecting these figures to India gives an approximate number of 21 million Indians above the age of 19 who are likely to have a history of MI. It is estimated that 10–40% of individuals with MI develop HF. This would mean that the likely HF burden due to MI in India would be 2.1 million to 8.4 million with a reasonable estimate of about 4–5 million. A total number of individuals below 20 years of age are about 450 million (454,868,000). The remaining population above 20 years of age (about 713 million) has prevalence of significant hypertension of about 10%; hence, 70 million people have significant hypertension. The overall prevalence of systolic and diastolic HF is likely to be about 5–10%; thus, the prevalence of HF due to HT is about 3.5–7 million with a reasonable estimate of about 4–5 million. Combining this estimate with that due to MI gives an overall estimate, which is the same as that extrapolated from the US population, i.e., 8–10 million. 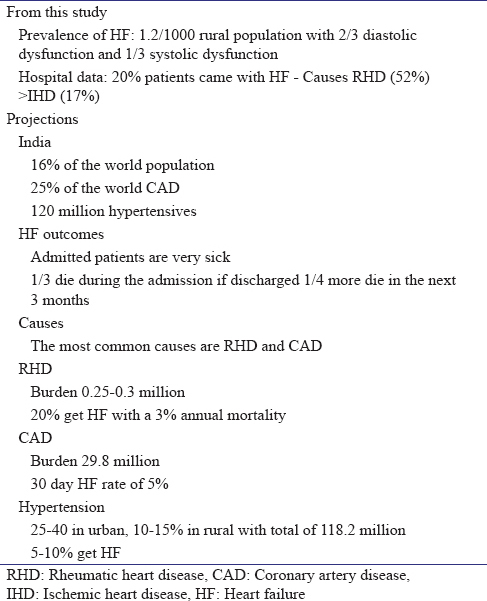 If we add the estimates of HF due to RHD and congenital heart disease (about 0.25–3 million each), the overall burden would be about 8.5–10.6 million. The overall adult mortality in India in 2000 was approximately 2.6 million. Assuming 4–6% of adult mortality is due to HF directly, the estimated annual mortality in India due to HF would be 0.1–0.16 million. This is in comparison to about 57,000 deaths annually in the USA in 2004. While the above discussed studies, estimates by practicing physicians and regulatory bodies and our own projections clearly point to a significant HF burden, what are the possible reasons for the low prevalence reported in our community study? The rural communities in North India have lower burden of CVDs, and thus, HF due to CAD and hypertension would also be expected to be less. The other major cause of HF in India is RHD, which was also the commonest cause of HF in our hospital-based study. In an ongoing study which is being done in the same rural setting in school going children, we have found clinical RHD prevalence of only 0.8/1000 which means that in this community, clinical RHD in adults would also be less likely as a major cause of HF. It is also possible that our sampling methodology leads to under-reporting of individuals with milder symptoms. The prevalence of HF in our study was 1.2/1000 [Table 4]. The hospital component of the study showed HF burden expected in a tertiary government hospital with RHD being the commonest etiology. The estimated prevalence of HF in India is about 1% of the population or about 8–10 million individuals. The estimated mortality attributable to HF is about 0.1–0.16 million individuals per year. This study is the first conducted for the estimation of community-based HF in India. Although the study demonstrates a low prevalence of HF in the surveyed rural community, our review of the projected prevalence suggests an alarming burden of HF in India despite a younger population than more developed nations. A significant proportion of this burden may be preventable with better screening and early identification and treatment of major risk factors. Urgent measures are needed to document HF burden on a nationwide basis. We acknowledge support for research provided by the UK India Education Research Initiative (UKIERI). Reddy KS. Rising burden of cardiovascular disease in Indians. In: Sethi KK, editor. Coronary Artery Disease in Indians. A Global Perspective. Mumbai: Cardiological Society of India; 1998. Swedberg K, Cleland J, Dargie H, Drexler H, Follath F, Komajda M, et al. Guidelines for the diagnosis and treatment of chronic heart failure: Executive summary (update 2005): The task force for the diagnosis and treatment of chronic heart failure of the European Society of Cardiology. Eur Heart J 2005;26:1115-40. McMurray JJ, Stewart S. Epidemiology, aetiology, and prognosis of heart failure. Heart 2000;83:596-602. Lloyd-Jones DM, Larson MG, Leip EP, Beiser A, D'Agostino RB, Kannel WB, et al. Lifetime risk for developing congestive heart failure: The Framingham heart study. Circulation 2002;106:3068-72. Joshi R, Chow CK, Raju PK, Raju R, Reddy KS, Macmahon S, et al. Fatal and nonfatal cardiovascular disease and the use of therapies for secondary prevention in a rural region of India. Circulation 2009;119:1950-5. Jafary FH, Kumar M, Chandna IE. Prognosis of hospitalized new-onset systolic heart failure in Indo-Asians – A lethal problem. J Card Fail 2007;13:855-60. Seow SC, Chai P, Lee YP, Chan YH, Kwok BW, Yeo TC, et al. Heart failure mortality in Southeast Asian patients with left ventricular systolic dysfunction. J Card Fail 2007;13:476-81. Seth S, Khanal S, Ramakrishnan S, Gupta N, Bahl VK. Epidemiology of acute decompensated heart failure in India: The AFAR study (Acute failure registry study). J Pract Cardiovasc Sci 2015;1:35-8. Joshi PP, Mohanan CJ, Sengupta SP, Salkar RG. Factors precipitating congestive heart failure – Role of patient non-compliance. J Assoc Physicians India 1999;47:294-5. Docherla M, Hande MH, Kavitha S, Shastry BA, Bhatia S. Comparative study of systolic and diastolic cardiac failure in elderly hospitalized patients in a tertiary care hospital in Southwest India. J Clin Diagn Res 2009;3:1529-36. Harikrishnan S, Sanjay G, Anees T, Viswanathan S, Vijayaraghavan G, Bahuleyan CG, et al. Clinical presentation, management, in-hospital and 90-day outcomes of heart failure patients in Trivandrum, Kerala, India: The Trivandrum heart failure registry. Eur J Heart Fail 2015;17:794-800. Lopez AD, Mathers CD, Ezzati M, Jamison DT, Murray CJ. Global and regional burden of disease and risk factors, 2001: Systematic analysis of population health data. Lancet 2006;367:1747-57. Strasser T, Dondog N, El Kholy A, Gharagozloo R, Kalbian VV, Ogunbi O, et al. The community control of rheumatic fever and rheumatic heart disease: Report of a WHO international cooperative project. Bull World Health Organ 1981;59:285-94. Rizvi SF, Khan MA, Kundi A, Marsh DR, Samad A, Pasha O. Status of rheumatic heart disease in rural Pakistan. Heart 2004;90:394-9. Arora R, Subramanyam G, Khalilullah M, Gupta MP. Clinical profile of rheumatic fever and rheumatic heart disease: A study of 2,500 cases. Indian Heart J 1981;33:264-9. Meenakshisundaram R, Thirumalaikolundusubramanian P. Valvular heart disease in Indian subcontinent: Social issues. Indian J Community Med 2009;34:57-8. Kumar R, Raizada A, Aggarwal AK, Ganguly NK. A community-based rheumatic fever/rheumatic heart disease cohort: Twelve-year experience. Indian Heart J 2002;54:54-8. Grover A, Dhawan A, Iyengar SD, Anand IS, Wahi PL, Ganguly NK. Epidemiology of rheumatic fever and rheumatic heart disease in a rural community in Northern India. Bull World Health Organ 1993;71:59-66. Jose VJ, Gupta SN. Mortality and morbidity of acute ST segment elevation myocardial infarction in the current era. Indian Heart J 2004;56:210-4. Spencer FA, Meyer TE, Gore JM, Goldberg RJ. Heterogeneity in the management and outcomes of patients with acute myocardial infarction complicated by heart failure: The national registry of myocardial infarction. Circulation 2002;105:2605-10. Velagaleti RS, Pencina MJ, Murabito JM, Wang TJ, Parikh NI, D'Agostino RB, et al. Long-term trends in the incidence of heart failure after myocardial infarction. Circulation 2008;118:2057-62. Mehta SR, Yusuf S, Díaz R, Zhu J, Pais P, Xavier D, et al. Effect of glucose-insulin-potassium infusion on mortality in patients with acute ST-segment elevation myocardial infarction: The CREATE-ECLA randomized controlled trial. JAMA 2005;293:437-46. Holay MP, Janbandhu A, Javahirani A, Pandharipande MS, Suryawanshi SD. Clinical profile of acute myocardial infarction in elderly (prospective study). J Assoc Physicians India 2007;55:188-92. Prabhakaran D, Yusuf S, Mehta S, Pogue J, Avezum A, Budaj A, et al. Two-year outcomes in patients admitted with non-ST elevation acute coronary syndrome: Results of the OASIS registry 1 and 2. Indian Heart J 2005;57:217-25. Xavier D, Pais P, Devereaux PJ, Xie C, Prabhakaran D, Reddy KS, et al. Treatment and outcomes of acute coronary syndromes in India (CREATE): A prospective analysis of registry data. Lancet 2008;371:1435-42. Lawes CM, Vander Hoorn S, Rodgers A; International Society of Hypertension. Global burden of blood-pressure-related disease, 2001. Lancet 2008;371:1513-8. Drazner MH, Rame JE, Marino EK, Gottdiener JS, Kitzman DW, Gardin JM, et al. Increased left ventricular mass is a risk factor for the development of a depressed left ventricular ejection fraction within five years: The cardiovascular health study. J Am Coll Cardiol 2004;43:2207-15. Okin PM, Devereux RB, Nieminen MS, Jern S, Oikarinen L, Viitasalo M, et al. Electrocardiographic strain pattern and prediction of new-onset congestive heart failure in hypertensive patients: The Losartan Intervention for Endpoint Reduction in Hypertension (LIFE) study. Circulation 2006;113:67-73. Pednekar MS, Gupta R, Gupta PC. Association of blood pressure and cardiovascular mortality in India: Mumbai cohort study. Am J Hypertens 2009;22:1076-84. Tocci G, Sciarretta S, Volpe M. Development of heart failure in recent hypertension trials. J Hypertens 2008;26:1477-86. Gupta R, Gupta VP. Meta-analysis of coronary heart disease prevalence in India. Indian Heart J 1996;48:241-5. Kearney PM, Whelton M, Reynolds K, Muntner P, Whelton PK, He J. Global burden of hypertension: Analysis of worldwide data. Lancet 2005;365:217-23. Grover A, Vijayvergiya R, Thingam ST. Burden of rheumatic and congenital heart disease in India: Lowest estimate based on the 2001 census. Indian Heart J 2002;54:104-7. Murray CJ, Lopez AD, editors. In: Global Health Statistics. Cambridge: Harvard University Press; 1996. p. 64-7. Saxena A. Congenital heart disease in India: A status report. Indian J Pediatr 2005;72:595-8. Cowie MR, Wood DA, Coats AJ, Thompson SG, Poole-Wilson PA, Suresh V, et al. Incidence and aetiology of heart failure; a population-based study. Eur Heart J 1999;20:421-8. Census of India. Provisional Population Totals. New Delhi: Office of the Registrar General of India; 2011.